Christopher Ware is a media sales expert with 18 years’ experience in selling print and digital advertising, event sponsorship and exhibit space. He’s generated millions in media sales for publications and events. Currently, he’s the vice president of business development for NAIOP, a national trade association for real estate developers. At NAIOP, he’s doubled revenue since the end of the great recession, doubled conference sponsorship sales, more than tripled the number of companies sponsoring and tripled digital advertising sales. But he’s best known for giving away free burritos to get his calls returned. Christopher is a well-regarded thought leader, speaker and writer on media sales and has been published in dozens of associations and exhibition management publications. Fred Diamond: Tell us a little bit about what you sell today specifically, and tell us what excites you about that. Christopher Ware: For those who may not be familiar with what an association is and what it does, the easiest analogy is it’s similar to a chamber of commerce where you have companies of like interests who get together for common purposes and those three purposes generally are peer to peer networking, education opportunities and in some associations’ case – and it is for ours – is lobbying on a state, local and federal level. I’m not involved in lobbying myself, but it’s certainly an important part of our value equation for our member. If you live in the Washington DC area – New York and Chicago are other two big areas for associations – you learn very quickly that if there are 3 or more companies that do the same thing there’s probably an association for it. Literally just about everything has an association so it’s a dynamic industry, it’s a fascinating industry and it’s one that honestly, most people coming out of college don’t know about and there’s huge career opportunities for sales professionals through the association industry. My association, NAIOP, we represent the commercial real estate developer, so some of our listeners might be familiar with the National Association of Realtors, that’s on the brokerage side, our members are on the developers side so they acquire property and actually fulfill a site plan to develop that property into office space, industrial space, other commercial usage. What I do is I help under write our programming by selling event sponsorships, we have about 6 national annual conferences that we produce of various sizes from a couple 100 people to over 15 hundred individuals. We also have a very robust digital media platform that is just growing exponentially right now and we sell advertising and sponsorship opportunities associated with that, and we also have a quarterly print magazine, so traditional ad sales, traditional print advertising sales. And of course, my goal is to try to bundle all 3 of those opportunities whenever possible and present that as a comprehensive solution for companies who would like to do more business with commercial real estate. Fred Diamond: Who typically do you sell to? Is it a chief marketing officer, is it a business owner, is it a peer of yours at the developers? Christopher Ware: It varies and it depends on the size of the company. I’ve worked with basically the intern or the office manager all the way up to the senior vice president of some national corporations, but typically it’s going to be the head of marketing or someone in the marketing department that I’m dealing with directly. Sometimes I deal with the sales staff but typically the ultimate decision maker that I work with is going to be some variation of VP of marketing, director of marketing, that sort of thing. Fred Diamond: Are these typically long term relationships that you’re trying to build here? Christopher Ware: That’s always my goal. Typically, I’m trying to sign companies up for one, two year sponsorship deals. I recently closed a deal for a three year sponsorship that I was very proud of and very excited about. But most companies will sign on for an annual sponsorship of some sort and again, ideally blending multiple conferences and some of our other platforms to reach commercial real estate, digital, print, media, etc. Fred Diamond: Very good. Take us back to the beginning of your career. We mentioned you’re a history major, so how’d you first get into sales as a career? Christopher Ware: Well, my corny joke is I was a history major that didn’t want to be poor. Honestly, I had no idea what I was going to do with that degree when I graduated college, and the very first company that offered me a job was, believe it or not, a company that rented trucks to businesses so I managed a truck rental office for the first few months of my career and a big part of that was going out and knocking on doors doing a lot of cold calling and just going to businesses that had trucks and maybe would like to rent some from me. I literally had no idea what I was doing, I was making it up as I went along but I tell you what, it was a very formative experience and it’s also where I learned probably the most important lesson for any new sales professional, and that was from the senior sales person I reported to. Sat down and said, “You know, Chris, the biggest piece of advice I can give you as a sales professional is banish from your mind the idea that you’re bothering people. You have a solution that they need. Now, they may not know that they need it yet, but you’re doing them a favor by contacting them. If you can set your mindset to that, you’ll be successful in sales. If you can’t get over that hurdle, you probably won’t.” Obviously I’ve been out of the truck rental business for a very long time but that lesson has stuck with me and it is one of the first things that I tell any new sales professional or anybody who finds themselves having to do sales is that you have to go into it with the mindset that you have a solution that they need and it’s going to benefit them. Fred Diamond: Banish from your mind that you are bothering people. It’s quite interesting because one of the key themes that crosses over a lot of the Sales Game Changers podcast is the notion that you are providing value for your customer, and the sales professionals that get better are the ones who truly are showing customers value that they had no idea was even available to them. How has that lesson continued today? You sell exhibition space, you sell sponsorship, you sell digital advertising, a little bit of print advertising. How has that notion, “Banish from your mind that you are bothering people”, how does that apply today? Christopher Ware: The first thing that I do when I have a company that I’m prospecting, before I pick up the phone, before I send an email, I’ve done at least some very base level research online and confirm that they are in fact a prime prospect. Often times what I like to do is there’s just so much great information online through LinkedIn, basic google searches, you have a chance to read people’s press releases. Ideally, and this is actually something that happened just this week, is a company that I was interested in recruiting as a sponsor went to their website and they listed as their clients several prominent NAIOP members. People that they’ve done business with. In my introductory email and introductory phone call, I called attention to that and said, “We have not only these companies, but a lot more just like them and by working with us, we can get you in front of that audience and we can help you grow your business.” So understanding that you have to bring value proposition to the table and you have to do it first, that really needs to be your lead off play in any sales conversation to break through that, “Why should I care” barrier is absolutely vital for anybody. Otherwise, you’re wasting their time and you’re wasting your time as well. So before you pick up the phone, before you schedule the meeting, before you send the email, already know what their needs are. At least have an idea of what that company’s needs are and then come forth with a solid solution that’s going to help them overcome that obstacle and help them be more successful. If you can do that, you’re going to be very successful. Fred Diamond: Christopher, tell us a little bit about yourself. Tell us specifically what you’re an expert in, tell us a little more about your area of brilliance. Christopher Ware: That’s a wonderful question. Again, as a history major I did a lot of reading and I did a lot of research in college and I think the modern notion of a sales professional or maybe the outdated notion of a sales professional is someone who’s a smooth talker and kind of a schmoozer and has a cigar in one hand and a bottle of scotch in the other, and they’re working the room and everything. That maybe is the mad men era idea of sales but I don’t think it’s applicable today. The thing that I consider my niche, something that I’m uniquely good at – maybe not uniquely good at, but good at – is applying the science of behavioral economics to day to day in the trenches sales. Behavioral economics is the science of how your brain makes decisions and it’s usually applied to public health campaigns to get people to stop smoking or to eat better or to drink less scotch, but the principles that define how your brain processes and evaluates information and then moves that information toward a decision, that can be used in any day to day sales operation. Being able to apply those principles, which is kind of professor like, kind of nerdy but use those principles to craft an email that is more likely to get opened. Use those principles to leave a voicemail that doesn’t get deleted. To use those principles to give a sales presentation that’s going to be impactful, and it all comes back to how your brain makes decisions and how it evaluates the relative value of something and if you understand that, you’re going to be much more successful. Fred Diamond: For the people listening to the Sales Game Changers podcast today, episode #10, with John Asher. We talked a lot about the neuroscience behind sales, there’s a lot of research coming out on how the customer’s old brain, the emotional brain, if you will, how they listen more effectively and it goes back to how is this going to help me with them. What’s in it for me? You mentioned someone in the early stage of your career who gave you some sound advice. Tell us about an impactful sales career mentor and how they impacted your career. Christopher Ware: I think only a history major can cite a book as a major sales mentor, but I’m going to do it anyways. Doctor Robert Cialdini and his book, “Influence the Psychology of Persuasion” really came along to me at the absolute right moment of my career where I was looking to take things to the next level and I think a part of being a successful professional, not just a sales professional, is knowing what you’re good at and knowing what you can improve upon. I knew I was never going to be the most charismatic person in the room, I was never going to be the most dynamic person in a room so I couldn’t rely on just charm and charisma to be successful so I had to be smarter than the next person. I had to be more educated than the next person when it came to sales presentations and what Doctor Robert Cialdini has done – and the book I think originally came out in the 1970’s and it’s been updated a few times since then – is he breaks down how your brain processes information and how it makes decisions and applies that to day to day sales operations. It really is a fascinating read, it’s actually a book that I give all of the sales professionals that have ever worked for me, I give it away when I do sales presentations, it’s the foundation of a lot of what I do day to day. It really has helped take me to the next level in terms of going from just an order taker sales person to one that’s going out there and landing new business. I can’t underestimate the importance of the book. If you’re in the business at all and you haven’t read it, put down what you’re doing, go get a copy right now and it really will boost your bottom line really quickly. Fred Diamond: I read that book when I was working for Apple Computers back in the late 80’s and I still remember it very clearly. Christopher, how long have you been with NAIOP? Christopher Ware: I started in 2001, so that is 16 years, 17 years. Fred Diamond: Good for you. You’ve been with the organization for quite a long time now. What are two of the biggest challenges you face today as a sales leader? Christopher Ware: I think time management is probably the biggest one. We have a relatively small staff, I have a team of 3, me being one of the 3. Getting all the stuff done that we need to get done is a constant challenge, and of course there’s so much information out there that is important but distilling it down and paying attention to the right stuff. I think a successful sales person in general can thrive in an element of chaos but the flip side of that is sometimes it can get overwhelming and time management I think for a lot of sales professionals is a constant challenge. As far as the second challenge is concerned, I think what makes a great sales person doesn’t always make for the best manager or the best administrator or the best boss. I’m always looking to improve my administrative and my boss skills, if you will. One of the problems – not really problems – one of the challenges of being a boss is sometimes you have to say and do things that don’t make the other person happy. Most sales people want to be liked, most sales people want to deliver good news and as a boss, sometimes you can’t do that. Now, fortunately I have not had many of those situations but I do think there’s sort of a disconnect there between what makes you a great sales person and maybe what makes you the great administrator, the great boss that you might be. That’s a challenge for me as well. Fred Diamond: I have a question, I’m going to take you a little bit off course here but I didn’t realize that you have been with NAIOP for so long. How has your customer changed? You’ve been with NAIOP since the early 2000’s over 15 years, here it is, 2018. Christopher Ware, you’re the VP of business development for NAIOP, you’re a professional association that supports commercial real estate developers. How has that customer changed over the last 15 years or so? Christopher Ware: I can tell you what hasn’t changed, is the need for relationships. Commercial real estates is a hand shake business still, and despite the evolving nature of technology, if you’re going to do a multi-million dollar deal, you want to meet face to face with that person. That hasn’t changed. What has changed is how people reach their potential audience, so thought leadership is increasingly important and that’s basically companies want to get out the fact that they are experts in their field and they still are interested in advertising, they still want their logo some place but increasingly, they want the opportunity to have direct conversations with our members and they want to have the opportunity to showcase their skills and their talents. One of the things that I have been able to do, one of the things I continue to be able to do is work closely with our content teams and when I say content teams I mean our magazine editors and our conference producers, people who select our speakers. When a sponsoring company has an important and relevant story to tell that will be of interest to our members to make sure that we communicate that, we also have some sponsored content opportunities where we clearly label that the content is coming from an advertiser but that’s something that is relatively new and it’s something that our audience was asking for. If we weren’t delivering it then it was going to go to somebody else, so that’s the challenge with an association is our members depend on us for reliable, quality, curated, un-biased information. That’s what sets us apart. Our sponsors and our advertisers want to influence that audience and it’s a very fine balance between those two, have I gotten the formula exactly right? I’m still working on it, but I think keeping those two elements in balance is probably one of the more important things that I do in my career. Fred Diamond: What’s the #1 specific sale success or win from your career that you’re most proud of? Take us back to that moment. Christopher Ware: That’s a fantastic question. Really, there’s two moments in my career and they actually happened fairly shortly after one another. As you mentioned, I’ve been with NAIOP for quite some time and I started out as the junior sales person in our department, basically selling the stuff that the VP of sales as the time didn’t want to sell any longer. She had a very long, very successful career with NAIOP and fantastic person and she decided that it was time to move on and do something else, and I was given the opportunity to act mostly in an interim basis as the head of the department and the biggest sales moment that I think set me on the pace of where I am right now was I met with our volunteer leadership at our annual conference. Not soon after, my former boss had left and my immediate boss here at NAIOP was there as well. It was my opportunity to basically say why I should be placed in charge of the department. I said I can’t be my predecessor, I can only be me but I can assure you that me is pretty good. Here’s my plan, here’s how we’re going to move forward, here’s the strategies that I think we need to adopt and let me have at it, and they let me do it. That was a really transformative moment at my career, demonstrating to our volunteer leaders who are some pretty heavy hitters within the commercial real estate industry that I was able to take that next step in my own career. The other moment isn’t really one sales moment as much as it is a series of sales moments and that was during the great recession. Commercial real estate, just like every other industry which is hammered from 2008, 2009, 2010, and I have a feeling a lot of people listening to this podcast right now probably never sold in a down cycle like that. It’s been a long time. I don’t ever want to go back to that economy, but at the same time I probably did some of my best work during that time period. I had to be the most creative, the most dynamic, do some really wacky things, we actually auctioned advertising off at one point in our magazine just as an experiment. It didn’t work but we tried it, but my sale success story here is we only lost one major sponsor during the great recession and that company went out of business, so I couldn’t do anything about that. But I sat down with all of our sponsors and I said, “Look, I know you’re not going to be able to spend this much with us this year, but we want to keep you in the family. We want to keep you at the table. How can we continue to work together?” and we customized packages for each of those sponsors and we kept them on board. Once the economy recovered, they continued sponsoring with us. The old adage is it’s far more difficult to find new business versus renewing existing customers and I took that philosophy to heart and I said our priority needs to be to keep these companies in the NAIOP community, keep them involved, keep them sponsoring and I was, like I said, for the most part successful and able to do that. We were able to reap the benefits tremendously once the economy started to recover afterwards. Fred Diamond: Did you ever question being in sales? Again, you’re a history major. Was there ever a moment where you thought to yourself, “It’s too hard, it’s just not for me”? Christopher Ware: I think every sales professional who’s honest with themselves has a moment of doubt that are they in the right career and it is a mentally very difficult career. It’s a career where you’re getting told no most of the time, and we talked about our shared love for baseball and I think one of the reasons why a lot of sales people that I know who love baseball, greatest hitter of all time, Ted Williams. Had a 400 batting average. What does that mean? It means 60% of the time he failed, and he wasn’t a lead hitter. A good hitter, 250, 300, that means 75% of the time you’re not getting a hit. That’s what I admire so much about baseball players is they get up to the bat knowing full well the odds are they are going to not reach first base, statistically speaking. That’s the same thing in sales, is you’re always having to get up to the plate and always having to try new things, always having to change your approach and those that are good are the ones that stick with it. It’s mentally challenging, so sure. I think it’s perfectly normal to have those doubts, the question is what do you do with that? Do you use it as an opportunity to learn new things? Do you use it as an opportunity to issue some new challenges to yourself? Do you change the way you do your business or do you let it pile up? I try to do the former versus the latter and evaluate what I need to be doing differently. But again, it’s a mentally difficult business and that’s one of the first things I would tell anybody looking at the career is you have to be mentally tough and it can wear down at you. But again, if you can get through that and again, using a more academic approach for lack of a better word, you can get through it and be very successful but it’s not anything that I would ever shy away from in terms over the fact that it can be a difficult career choice for folks if you don’t have the right mindset. Fred Diamond: Christopher, what’s the most important thing you want to get across to the selling professionals listening to today’s podcast to help them improve their career? Christopher Ware: I think #1 on my list is never stop learning. You constantly need to educate yourself, not only on the trends in the industry that you sell in but also big picture business trends, technology trends. The curious mind is probably your best asset as a sales professional and you’re always asking why, you’re always noticing things that people are not. I think that’s #1 is if you stop learning, it’s time to maybe retire or find a different career. Expect to fail, we talked about that earlier. Elite hitters in baseball fail most of the time, you need to go into a situation expecting that you quite possibly can fail. In my mind it’s never a failure if you’ve learned from it, so go into a situation, be willing to try new things. If it fails, that’s OK but learn from that failure and come back with a better proposition next time. Perfect is the enemy of good is one of my corny sayings. I think a lot of successful people understand that you’re never going to have a perfect situation with the sales presentation or an environment, but often times a good one is more than good enough, so don’t always focus on having everything be exactly perfect. Consider every sales encounter as a learning opportunity, and even if you didn’t close the deal. If you learn from it and you did something that’s going to help you make a better proposal next time, then that’s an incremental success that you can build on over time. Christopher Ware: I think the most important thing to do – Fred, your organization is a great job at this – is meeting with other sales professionals. I think that’s just absolutely essential. It is just incredibly refreshing to be in a room full of people who do what you do, and one of the things that I’ve learned over the years meeting with anybody in sales whether they’re selling – I think we met a gentleman the other day who sells barbecue catering, fantastic guy, somebody who does chimney sweep services. It doesn’t really matter what it is you’re selling. We fundamentally face the same challenges and that’s just incredibly refreshing. A lot of times, people in different industries come up with some very different solutions to common problems, so that’s just absolutely huge. You need to build your network anyway, but picking the brain at people who sell that don’t compete with you. If you have the opportunity to do that, you have to do it. I actively steal, and what I mean by that is I copy ideas from other businesses. Retailers are a great example. They have spent lots of time and money working out ways to get you to spend more money with them, so I try to take queues from that. One example that I cite is a restaurant menu frequently will have a very expensive item at the top, and one of the reasons they do that – and they don’t necessarily expect you to buy the flambé with lobster and champagne, if you do, great – but one of the primary purposes is to make everything else on the menu look more affordable. A way to apply that is if you have a list of options for a customer, maybe put a premium option down there that’s 25, 30% more than everything else. If they buy it, great, but it also serves to function in making everything else look more affordable by comparison. Christopher Ware: I think it’s important – this sounds like a mutual fund advertisement – but past performance doesn’t equal future growth. You can never rest on your laurels and especially now. We’re living in an age of disruption. Entire industries are going bust and new ones are taking their place. You can’t open the paper or go online or however you get your news without hearing about legacy industries struggling to keep up in the modern environment. It could be a big threat, but I think it also could be a massive opportunity. Working for a trade association, the association model is probably about 150 years old, it has its roots in the 19th century, very common in the 20th century. Associations are incredibly valuable but they’re also ripe for disruption and one of the things that I’m constantly working on with our volunteer leaders, with our staff here is if we don’t continue to evolve and meet new members and new customers where they are, I’m worried that we become Blockbuster to the next Netflix or maybe more accurately, a cab company compared to Uber. People still take cabs, but not nearly as often as they used to. We are constantly looking at our offerings and making sure that they’re still fresh and still relevant. I think if you assume that everything you have is fine, you’re probably falling behind. One example, a key reason why someone would come to one of our events is networking, and for years that meant cocktail party and show everybody into a room and just assume it happens, and that still works but we have piloted several programs with structured networking which is another way of saying speed dating but for businesses where we make sure that the room circulates and we make sure that people meet people and they find common things to talk about. That’s huge for us, studies have shown very consistently if you make a couple new relationships at a conference that you’re going to come back and you’re going to be continuing customers. That’s just one of several examples of some of the initiatives that we’re working on right now to continue that the association model is successful into the future. 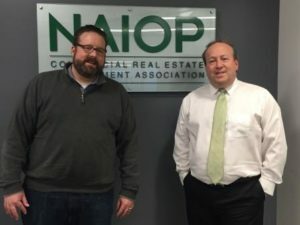 NAIOP just celebrated last year our 50th anniversary, I want to make sure that we’re around to celebrate the 100th, and the 150th going forward. Fred Diamond: Sales is hard. People don’t return your phone calls, they don’t need to read your emails. Why have you continued? What is it about sales as a career that has kept you going? Christopher Ware: I’m working on a theory that sales is a lot like jazz. A jazz musician is a skilled musician, they know how to play their instrument, but they almost never play the same song twice. It’s a lot of improvisation and when it’s done right it’s absolutely beautiful. I think in sales, you need a skill set. You need to have a base line set of knowledge, but if you’re going to be really elite you’re going to have to know how to improv an awful lot and I think that’s what’s fascinating about the career for me. The same approach seldom works exactly the same way twice, so I’m constantly having to tweak what we’re doing, tweak the offering, tweak the way we present information looking for new customers, looking for new opportunities. If it were the same thing over and over again, it would get dull pretty quickly but that’s really been the great thing is the industry’s constantly changing, the approaches are constantly changing and we’re always having to improv, always having to think on our feet. That’s what I find really interesting about it, that’s what I think is fun about it and that’s what keeps me coming back. Fred Diamond: Christopher, give us a final thought that you’d like to share to inspire the Sales Game Changers listening around the world to today’s podcast. Christopher Ware: I would say the #1 thing to be a successful sales person is find your passion and if your passion is sales, that’s fantastic but I don’t think it has to be for you to be successful. If you’re passionate about baseball, if you’re passionate about movies, if you’re passionate about travel, whatever it is, focus on that and sales is a fantastic career. You can do extremely well at it, I think it’s a disservice in life to think that your career and your passion have to be the same thing. If it is, great. If it’s not, that doesn’t mean you’re a failure. Continue to hone your craft, continue to be a good salesperson, continue to learn how to close deals and let that, to be quite blunt, bank roll what your true passion is. I think that’s fine. In fact, I think it’s preferable, because again, people like to do business with other people and they like to do business with people who are interesting. So if you have a story in your life, if you have a hobby, if you have a passion, let that be a part of your sales presentation. Let that be a part of your sales game if you will. It’s going to get you a lot further than you might think.